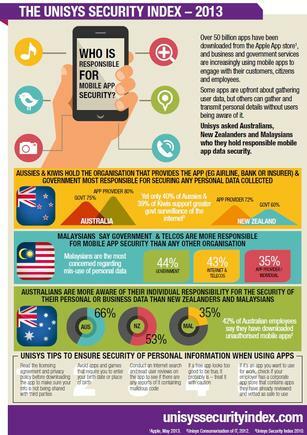 Infographic: Security on mobile apps - who is responsible? Around 76 per cent of Kiwis are concerned about data breaches at banks and financial institutions compared to only 57 per cent concerned about health organisations including hospitals and doctors. The 2013 Unisys Security Index found that Kiwis are more concerned about data breaches at banks and telcos than in goverment departments, health organisations or airlines. According to the index, younger Kiwis are more concerned about unauthorised access to/or misuse of personal information (61 per cent of 18-45 yr olds) compared to 50 per cent of 35-40 yr olds. Kiwis and Aussies hold organisations that produce an app, and the government, most responsible for securing the data that is collected by mobile apps. The below infographic gives more details. Click here for a high-res version of the infographic.